Road commissioners have a big responsibility and long hours during bad weather that come along with their job. During ice storms and snow storms and white-outs, the public is warned to stay off the roads while they sacrifice their safety and time home with family to make sure the roads are safe as possible to travel on. David Anderson is one of those people who does just that. He recently took over the job of Road Commisioner in the spring for Durham township which makes him responsible for about 30 roads. Although he has not been Road Commissioner long, he has had to deal with excess rains this past summer and fall and now snow and the recent ice storms that has finally found us this winter. Anderson states that the roads were very slick and a little scary during last week's ice storm and that there was one road that could not be taken care of and that the hills and curves were the worst. Todd Stevens, long time resident of La Harpe, has been Road Commissioner for La Harpe township for 20-years. He has been working for the township though since 1972 and says he loves his job and what he does. Stevens said the roads were very slick during the recent ice storm and it has been the worst so far this winter. He can remember a time back in 1978 or "79 that the roads were so bad that it was like driving through a tunnel from all the snow. Stevens uses a salt/cinder/sand mix for the roads. He states that the salt cost $75 a ton but that is down from last year when it cost $125 a ton. He is able to get the cinders for free except for what it costs to haul it from Western Illinois University's heating plant. So far he has used 80-90 ton of cinders. Stevens likes to do the roads that are south of the elevator first because he says there are so many hills and curves out that direction. Stevens has 30 miles of blacktop to take care of and all together 48 miles. 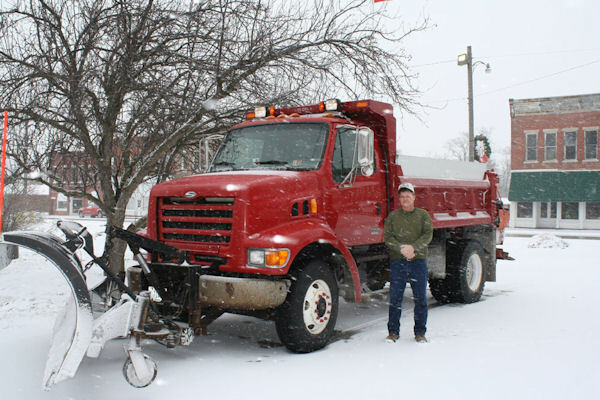 It's nothing for him to be out working by 2:00 a.m. or 3:00 a.m. on a snowy night to get these roads clear enough for use. The roads are so saturated that Stevens fears it's going to be a challenge to get them in good shape this spring. The roads are already soft and some of the blacktop is breaking away due to the water and weather we have been having and the temperature variations. It is not cheap to work on these roads, Stevens explains. "The cost of the road oil is going for $2.30 to $2.70 a gallon which is about $11,000 a semi load. This will only cover a mile to a mile and a half," he said. "Back in 2005 the cost was only $.93 to $.95 a gallon." The money that Stevens receives for the work on the roads is based on the township total mileage and is calculated from the motor fuel tax. "I receive about $1100 to $1200 a mile" say Stevens. He also receives money for the roads and other expenses from the taxpayers. So next time when you're all snuggled in your warm beds at 2:00 or 3:00 a.m. and there's a big snow fall or ice storm, remember those who are out cleaning the roads-city crews in town, state and county crews on state and county roads, and in the country, the Road Commissioners who are working on some of the most challenging roads of hills and winding roads to help keep drivers traveling safely. Todd Stevens, La Harpe Township Road Commissioner, stands by his truck that helps him keep country roads safer.